Next Monday, we will have our last ultrasound before baby comes. This one will be a growth scan which we haven't had in a few weeks. It will be good to have a sense of how big baby will actually be when he is born. I'm hoping for at least 5 lbs. Hopefully, we'll have it a little more decorated before baby comes home, but I guess he won't really know the difference if we don't get it done! Oh my gosh, Stacey!! Wow!! You are so close!! I am so happy you have made it this far! 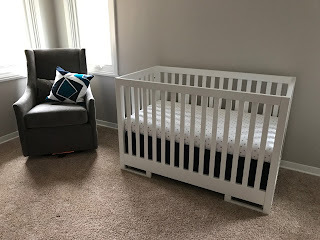 The nursery looks great...simple and ready for your baby. Take deep breaths this weekend! Please, please call or text me if I can do ANYTHING at all for you. I love you lots! !